Well, it’s still February, but we’ve passed the half-way point. The wild temperature swings – high about 15 one day, about 55 a few days later, then back to about 35 – have eased for now. I watched my oh-no-it’s-still-February movie, Enchanted April (1991), and its effects linger three days later. We actually got a minyan for both evening and morning services for my mother’s yahrzeit this week. And on Monday, I am finally going to use my husband’s gift card for a hot stone massage. So, I actually feel reasonably irenic. This week’s Torah portion, Tetsaveh , also conveys a peaceful, low-key mood. After all, it’s just instructions for the olive oil and eternal light; instructions for the ordination of Aaron and his sons as priests, though this doesn’t actually happen yet; specifications for an altar for burning incense; and, mostly, the vestments for Aaron as High Priest and his sons as ordinary priests. Interestingly, although the Lord is clearly telling Moses what to do, the name “Moses” is not mentioned at all in this portion. Yes, we should know by now to whom the Lord usually talks, but this omission also signifies that the focus here has shifted from Moses to his brother Aaron and Aaron’s sons, the soon-to-be-ordained priests. Clothes are important beyond providing warmth and protection. Certain outfits signal certain status, like uniforms, professional garb (a doctor’s white coat & the medical school white coat ceremony, which only dates back to 1989); academic regalia and being hooded when you get a doctorate; and, of course, wedding dresses. More generally, clothing denotes societal status. When I was a research chemist, those who were or wanted to be managers wore suits; scientists and engineers generally wore business-like clothes (but not too stuffy), except for those in Central Research, who wore jeans; technicians wore jeans; and secretaries dressed slightly down from managers. The importation of silk and lace by Lombards and other foreigners were forbidden. Thus, the literary device of changing clothing to alter identity was quite believable. Have 16th c. Prince Edward and pauper Tom Canty switch clothes, clean up Tom and dirty up Edward a bit, and the Prince and the pauper have exchanged identities. The breastplate includes12 gemstones, whose names my daughter had a devil of a time learning for her Bat Mitzvah), each carved with the name of one of the 12 tribes. Thus, the High Priest visually represents the entire people. The mysterious Urim and Thummim, contained within the breastplate, are used to get divine answers to the High Priest’s queries, kind of like a divine “Magic 8 Ball” (I’m still waiting for a sci-fi story based on this). Attached to the hem of the blue robe are alternating golden bells and yarn “pomegranates,” the bells “so that the sound of it is heard when he comes into the sanctuary before the Lord and when he goes out — that he may not die.” (28:35) The bells’ tinkling announces the High Priest’s presence – to whom? The Lord? The people gathered outside? 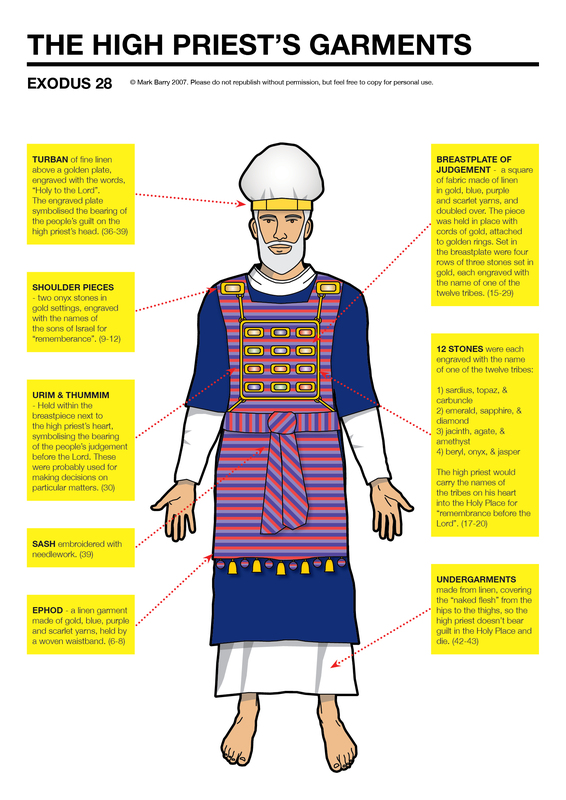 Or is it confirmation for the High Priest himself as a sign he was fully dressed (Rashi)? Finally, the gold diadem on the High Priest’s head is to remove any wrongdoing connected with Israel’s offerings and to ensure, through its inscription that Israel’s worship is “Holy to the Lord,” that the Lord graciously accept their offerings. Next week: The Golden Calf. 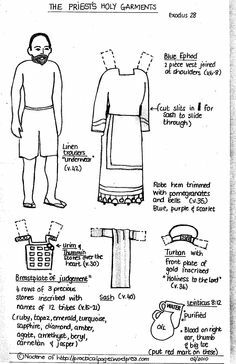 A High Priest paper doll! About one third less than for a regular bulb. How many thought police does it take to screw in a light bulb? There never was a light bulb. How many Real Men does it take to screw in a light bulb? 1. None. Real Men aren’t afraid to sit in the dark. 2. None. Real Men replace the whole lighting fixture. How many lexicographers does it take to change a light bulb? Two. One to change it and one to protest that he should have changed it to “lightbulb”. I have a PhD and didn’t bother walking at my own graduation. The research university which now employs me requires all professors to attend spring graduation. I looked into buying the full regalia, but that c*#p was around $500. So, I bought a used high school graduation robe from ebay for $10 and I wear it every year. I joke that one day I might add velcro stripes to the arms and maybe a star trek badge on the lapel just to see if anyone notices. Welcome to StupidStuff.org’s “non-Magic 8-Ball” page. We’d love to call it the “Magic 8-Ball” but lawyers from Tyco Toys (the owners of the “Magic 8-Ball” trademark) pop out of the woodwork and send threatening letters whenever anyone dares to use the words “Magic” and “8-Ball” in the same sentence. Never fear, though- our non-Magic 8-Ball works exactly the same way. Just think up your question and press the ‘Answer My Question’ button (at the above link) to shake the ball (then wait) and receive some timeless 8-Ball Wisdom. Regular Version: e.g., It is certain. Yes. Outlook not so good. Sarcastic Version: e.g., Not a chance in Hell. Your mama says no. Forget it, you loser. You Know You’re A Rockhound If: You colour co-ordinate your clothes and shoes to match your gemstone pendants. Rockhound & Lapidary T-Shirt Slogan: May the quartz be with you! Q. Where do you find the President of the jewelry company? A. He’s the one in the Opal Office. Q. What did Mr. Rabbit give Mrs. Rabbit? A. A 14 Carrot Gold Ring. This entry was posted in Uncategorized and tagged Aaron, bells and pomegranates, breastplate, ephod, eternal light, Exodus, High Priest, incense altar, ordination, priestly vestments, Urim and Thummim. Bookmark the permalink.